Welcome to the official webpage for the Shasta Garden Railroad Society! 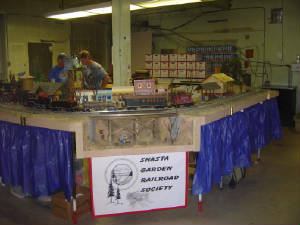 The Shasta Garden Railway Society is a group of about 30 active members and wives who all share a common interest.....large scale trains! We meet at each other member's houses once a month to talk, share a potluck meal and play trains. Meetings are held in the general Redding area, and also Anderson, Cottonwood, Red Bluff, Chico, Weaverville, Lewiston, and Hayfork. We cover 4 counties in northern California: Shasta, Tehama, Butte and Trinity. Click here for information on how to join SGRS!